"The Daleks will deal with them, there is no need for the delay in their extermination." 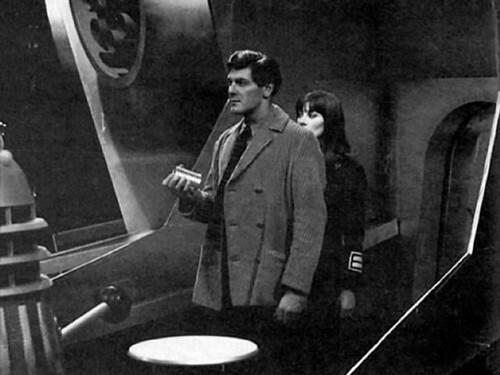 The Visians attack the Daleks allowing the Doctor, Steven & Sara to escape. They attack the lone Dalek sentry blinding it with mud and steal the Dalek ship. Mavic Chen returns to Kembel and receives a hostile reception from the Daleks who blame him for the non recovery of the Taranium Core. The Doctor plans to make a copy of the core to deceive the Daleks when they discover that the Daleks have taken control of the ship and are steering them to Kembel. Steven uses the gravity force power on the ship to activate the fake Taranium Core and make it glow but is injured in the process and trapped within a forcefield. Chen wants to take the Doctor and friends back to Earth for a show trial but the Daleks convince him to let them deal with the travellers. The ship returns to Kembel and Steven emerges first carrying the fake Taranium Core. The Doctor demands to hand the Taranium over outside the Tardis. Sara accuses Chen of being a traitor. Reaching the Tardis, Sara & the Doctor go inside leaving Steven to hand the box over to Chen. The Daleks fire on Steven but the dying forcefield protects him allowing him to escape with the Doctor, Sara and the genuine Taranium Core in the Tardis. When the Tardis lands the scanner malfunctions and the readings indicate a poisonous atmosphere. Now this is odd. Last time round I felt this episode picked up after the lull inthe last one. This time round the first five formed a relatively solid block but for whatever reason, be it the change in writer or having had a bit of a break between last episode and this one, or it being the first episode of the serial where no footage exists, this episode didn't quite click got me this time. Yes there's much more Daleks and much more action this episode. But there's elements that just don't quite click for me. Steven suddenly experimenting with trying to activate the fake tarranium core using the gravity force is one, and the accident giving the fake core the force field that allows the Doctor, Steven & Sara to escape. But it does effectively closes the first half of the story and indeed it's where Mission to the Unknown, the first of the two Target novels by John Peel that make up The Dalek Masterplan, ends. It's a good natural point to split the story. The Doctor has now evaded the Daleks using his Tardis and without the Taranium Core, which he has, the Daleks' plans are useless. Looking back the first half of Daleks' Masterplanis actually a pair of typical Terry Nation plot devices welded together. 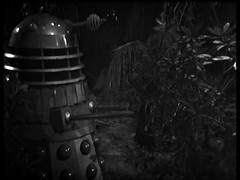 Firstly the Doctor is unable to use the Tardis: here it's marooned on Kemble while in the Daleks it was faulty, in Keys of Marinus it was protected by a forcefield and in Dalek Invasion of Earth it was burried under rubble. We'll see that last one again in Destiny of the Daleks but he'll be separated from the Tardis again in Android Invsion, and from his then means of transport in Genesis of the Daleks, while a power failure stops him leaving in Death to the Daleks. As well as being unable to use the Tardis the Doctor spends the first half of the story on the move, just like in Keys of Marinus and the Chase. Here the transport is stolen spaceships and one accidental teleport as opposed to travel bands and the Tardis. 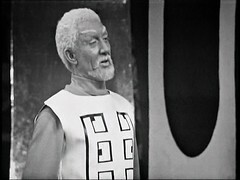 The Chase influence becomes much more obvious in the second half as the Daleks use another time machine to follow him. You can throw another Nation trope into this episode: Daleks are imobilised by blinding them, here with mud. See also The Daleks, where mud is also used, Planet of the Daleks, an electronic device, and Destiny of the Daleks, The Doctor's hat! SUPREME DALEK: Destroy pursuit ship. They have failed in their mission. We will not tolerate mistakes. SUPREME DALEK: What news of our force? 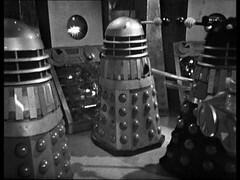 DALEK: They are stranded on the planet and under constant attack from the invisible creatures that inhibit it. SUPREME DALEK: Dispatch a rescue ship to their aid. They will be dealt with on their return. Meanwhile, I will personally supervise recovery of the core. IMDB credits one new actor in this episode: Francis Willey is the Visians. As they are unseen and don't speak I'm at a loss to say what he did! He'll return in The Massacre 4: The Bell of Doom as a guard. We're back to CD now for the next 4 episodes which is the largest consecutive section in this story not to contain an existing episode. It's also one of the sections of the story least documented by pictures and part of the problem with this episode might be that there's nothing to look at, no moving visuals, no tele snaps and very few photos. There's the one above of Steven, Sara & the Dalek ship which I believe was taken by designer Raymond Cusick. You can see several others in The Raymond P Cusick Signature Collection. But, aside from the Dalek ship the Tardis crew capture and where they land there's little that new and previously unseen here. We know what the Chen, the Daleks and their base look like from prior episodes. Indeed the base probably provides hints to what the ship looks like! 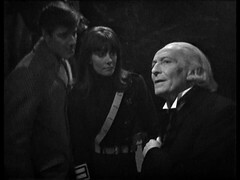 Hartnell' Doctor and Steven we're familiar with and Sara & the Miran jungle were both seen in the previous episode. So unlike many of the completely missing episodes withno telesnaps it's easy to fill in the gaps here. Initially the Dalek Masterplan was conceived as a six part series and Nation was contracted to write six episodes. However plans changed, and twelve episodes it became. Reasons are slightly unclear as to why the decision was taken for Terry Nation to write half of it, although he was at this time busy script supervising his new ITC series The Baron. So Dennis Spooner, outgoing script editor and writer of Reign of Terror, The Romans & The Time Meddler, was commissioned to write the remaining six episodes and Daleks' Masterplan becomes the first Doctor Who story to be written by two authors. I've seen it claimed that Donald Tosh, the current Script Editor, had to do some work on Nation's episodes to bring them up to scratch. Anecdotal evidence exists from several script editors about the length of Terry Nation's scripts up to and including Ken Grieve's claim that Douglas Adams wrote 98% of Destiny of the Daleks. Having checked, there's a story repeated in print in About Time: 1963-1966 Seasons 1 to 3 (so if it's inaccurate sue them not me !) of Terry Nation turning up in a Taxi at Donald Tosh's flat and delivering 24 pages of notes for his six episodes before fleeing into the night to catch a plane to Heathrow airport and leaving Donald Tosh to tidy them up into the scripts for the first five and the seventh episode. The author of about time intimates that Tosh is the source of the story but doesn't note where he was meant to have said this. Donald Tosh interviews are a little thin on the ground so you may have to take this story with a small pinch of salt. However if you put it together with Grieve's claim and the distinct Robert Holmesian feel of Genesis of the Daleks..... I will leave it as exercise to the reader to draw conclusions. Just as the writing task was split between two people so was the design: Raymond Cusick, who created the Dalek design, appears to have handled the first six episodes with the remaining ones the responsibility of Barry Newbery, who started on Doctor Who by doing the second, third & fourth episodes of the first story. In fact this is the last episode of the series that Cusick works on. Since I blogged about this story I've become aware of a number of control panels that keep appearing in Doctor Who episodes. There's several in the previous episode and I've updated the text there to reflect that. 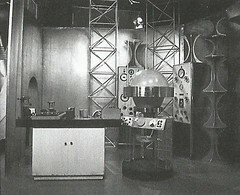 There's very little visual material relating to this episode surviving but The Raymond P Cusick Signature Collection, which you REALLY need to own if you're interested in early Doctor Who sets, contains a number of set photos one of which is of the lab where the fake Tarnaium core is made. You can quite clearly see two panels very similar to those we've seen in the previous episode. More and repeat appearances will follow.